To book your cruise, click on one of the packages listed below to see available dates and times. You can also call us at 651-439-1783 to book by phone. Looking for a quieter time? Book an evening or weekday ride. Gondola gift certificates make unique gifts. Just click the Gift Certificate link for the cruise you want to give. Ready for Spring and Summer? Book a cruise now! 45 minute gondola cruise plus lunch at the Dock Cafe. Lunch is available from 12 to 3 pm. Cruise is available from 12 to 4 pm. $149.95 for party of 2, plus tax. 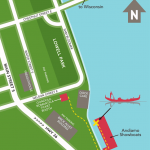 Bring your own picnic and beverage on this 45 minute cruise. $99.95 for party of 2, plus tax (each additional person is $35, plus tax). 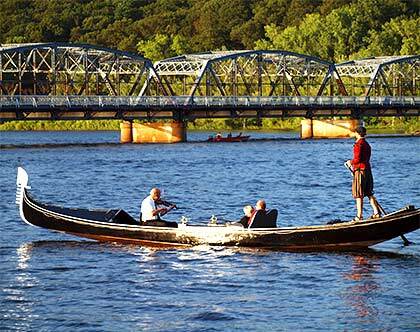 Enjoy a relaxing one-hour cruise on the historic St. Croix River. Bring your own picnic and beverage. $129.95 for a party of 2 + tax (each additional person $35 + tax). 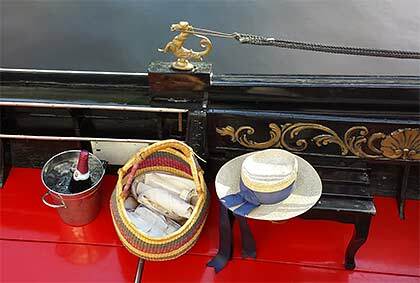 A gourmet picnic basket is included on this 1 hour cruise. Celebrate your special occasion! $169.95 for party of 2, plus tax (each additional couple is $99.95, plus tax). Monday through Thursday only. 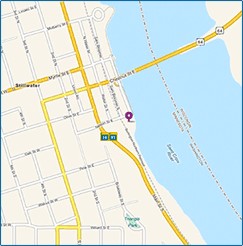 Enjoy a meal at Stillwater’s riverside Dock Cafe and a 45 minute cruise. $169.95 for party of 2, plus tax. 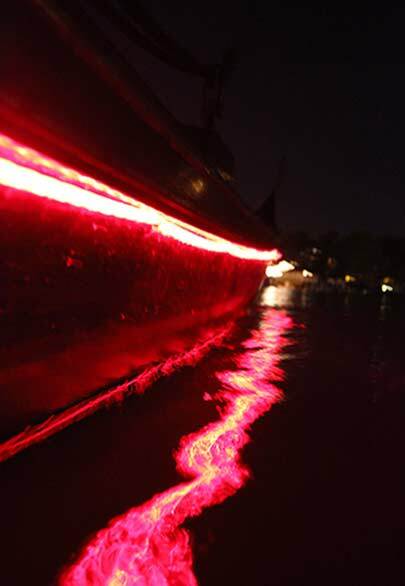 Treat yourselves to a 5-course meal at Stillwater’s riverside Dock Cafe, followed by a very special 1 hour cruise. 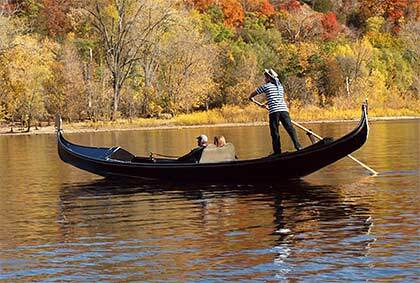 A Gondola Elegante cruise includes a red carpet, roses, and a gondolier in traditional 16th century dress. $330 for party of 2, plus tax. Have a ticket that was a donation to a good cause? Redeem your special donation certificates here. Check your ticket for the right name. Gratuities for the gondolier are customary. Most people like to tip the gondolier 15%-20%. Custom packages are available for your special occasions. Call to make individual arrangements. Walk-up rides are available as our schedule allows. Talk to the gondolier. You are invited to bring food and beverages to enjoy on your ride. Alcoholic beverages are permitted. Once booked all tickets are non-refundable. You can change the time and day of your scheduled ride up to 72 hours before the booked ride. No changes 72 hours before the booked ride. 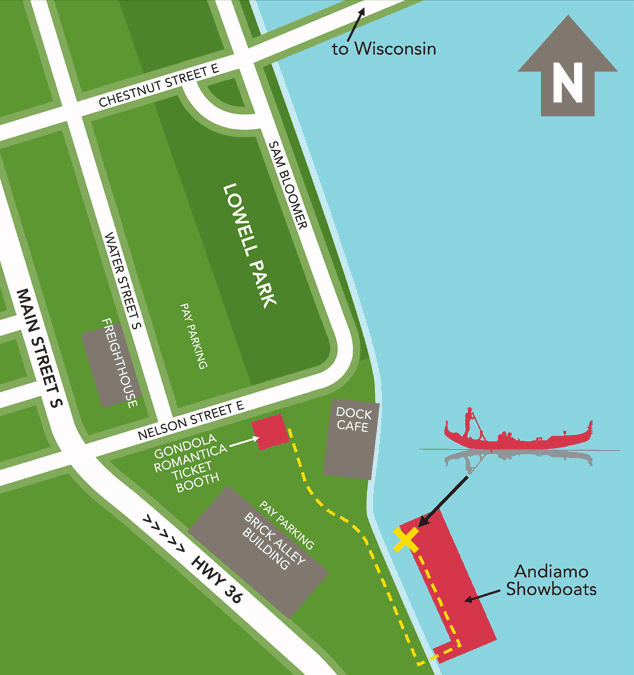 The Gondolier will decide if rain or unsafe weather should be a factor in canceling a ride. If a ride is canceled by Gondola Romantica, Gondola Romantica will re-book your ride at the earliest possible opportunity or issue a Gift Certificate good for one year. 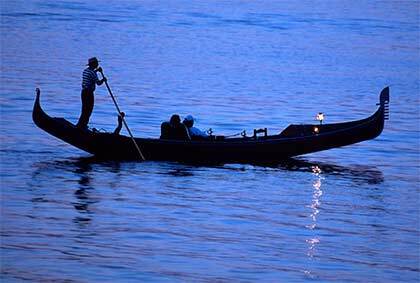 Gondola Romantica (“GR”), at its sole discretion, reserves the right to refuse anyone a ride. GR retains the right to, at the sole discretion of the Gondolier, cancel or terminate a ride due to inclement weather or other safety concerns. 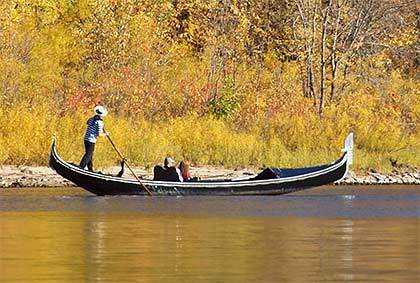 Passenger agrees to conduct himself/herself in a courteous and safe manner while boarding, riding in, and exiting from the gondola watercraft, that he/she will act responsibly commensurate with the nature of the activity, and that he/she assumes all risk of accident or injury. Passenger agrees to promptly follow and comply with all instructions and directions from the Gondolier; failure to do so will result in cancellation or termination of the ride. 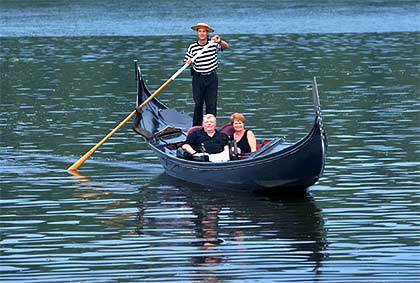 Disruptive or unsafe behavior, as determined by the Gondolier, will result in early termination of the ride without refund. Minors (or, persons under the age of 17) must be accompanied by a responsible parent or guardian. 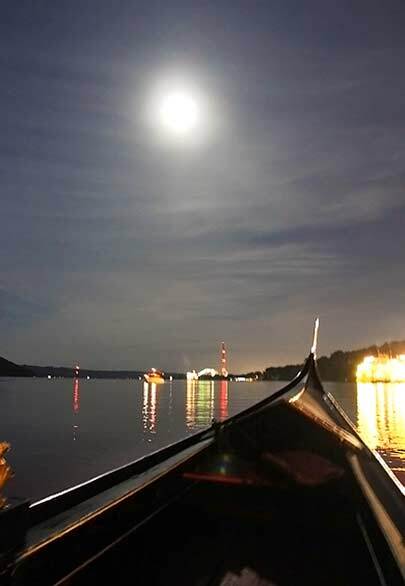 For a truly magical cruise, choose a nighttime or full moon ride, lit by the stars, moon and lights from the gondola. These are the full moon dates for this year. The moon is nearly full 2 days before and 2 days after the date.